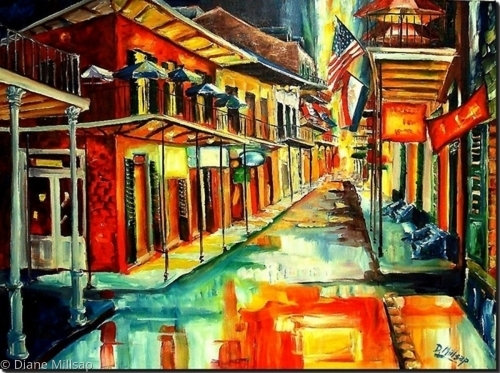 NEW ORIGINAL FOR SALE: Late at night in the French Quarter, the lights and the streets sparkle. Painted on a gallery-wrapped canvas, ready to hang. Please contact me for purchasing information. 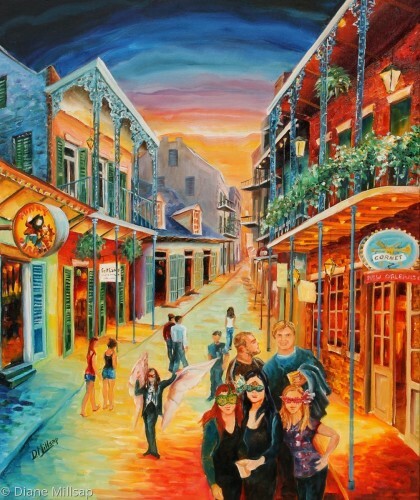 Sample of a commission: Favorite jazz bars and a winged street performer are highlighted for a fun-loving family that wanted to remember their time on Bourbon Street. 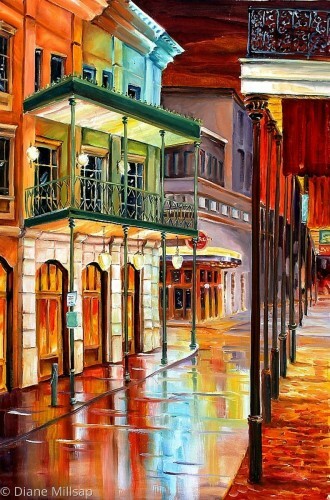 SOLD: The Lights on New Orleans' Bourbon street illuminate the night in this large original oil painting. Painted on a gallery wrapped canvas. Ready to hang. 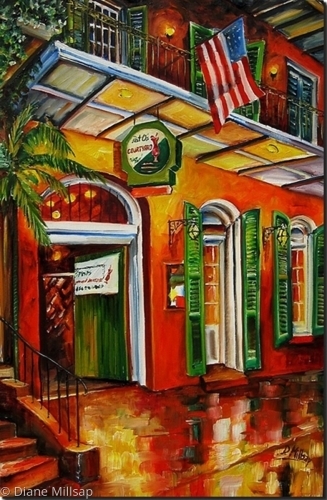 SOLD- Bold colors and darkened doorways reflect the history and legend of New Orleans' Old Absinthe House, named for the notorious drink, Absinthe. This large original oil is painted on a gallery wrapped canvas and is ready to hang. 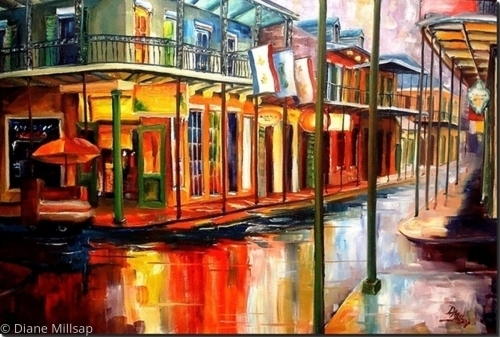 SAMPLE OF A COMMISSION: This original oil captures the glow and reflected lights on New Orleans' renowned Bourbon Street. Please contact me if you're interested in ordering a custom painting. 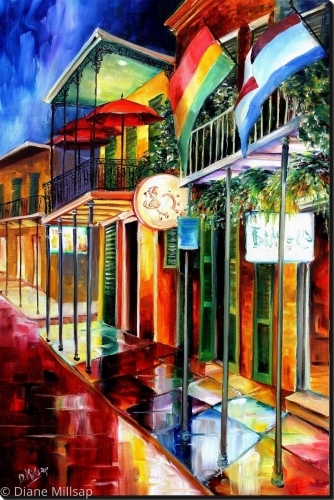 SOLD - The rain calls only a temporary halt to Bourbon Street business in this orginal oil. Bold reflections in gold and red are contrasted against the cool blues of the street. Painted on a gallery wrapped canvas. Ready to hang. 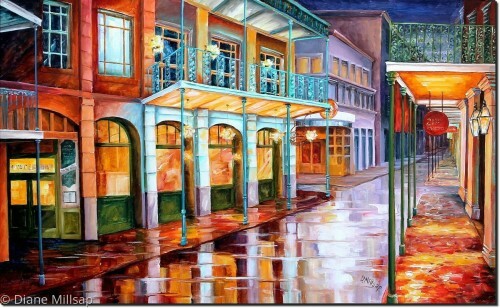 The lights on Bourbon Street shimmer and dance on into the night in this original oil painting. 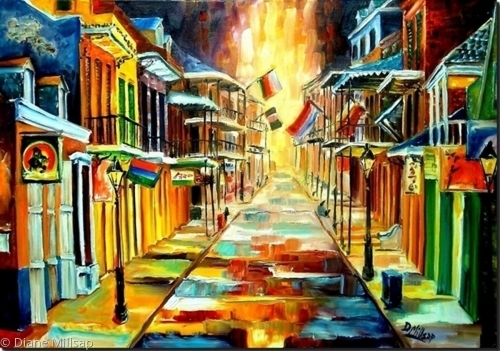 All the dazzle and excitement of New Orleans' Bourbon Street are captured in this large original oil. Done in an abstract-impressionist style this painting has vibrant color and rich texture. It may be hung unframed. (The sides of the 1 1/2" deep canvas are also painted so that the images wrap around the sides.) A picture wire kit is included. 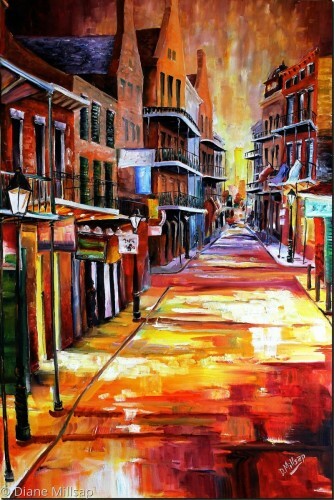 This large 36" square oil painting captures the color, the lights and the energy of New Orleans' Bourbon Street. Bold warm colors have been applied in Diane's signature modern impressionist style. 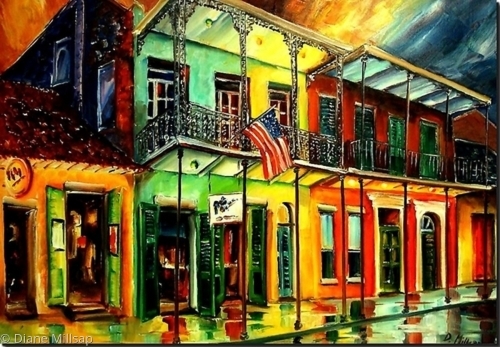 This large, vibrant oil painting grabs your attention and then draws you in to a glowing night on Bourbon Street. Painted on a deep gallery wrapped canvas. Ready to hang. 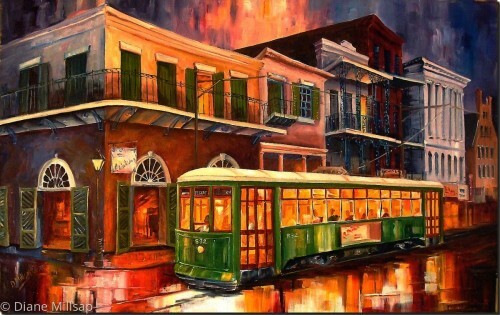 Dazzling lights and doors open wide invite us to experience good times in the Big Easy. Painted in a modern impressionist style this oil painting is vibrant and glowing. It may be hung unframed. The edges of the gallery wrapped canvas are painted and a picture wire kit is included. Nothing can compare with the lights on Bourbon Street! This original oil captures the special glow that these old buildings take on after dark. Painted in Diane's modern impressionist style with wide brush work and bold color. A one-of-a-kind work, taken directly from Diane's own photos. Edges of deep gallery wrapped canvas are painted also. 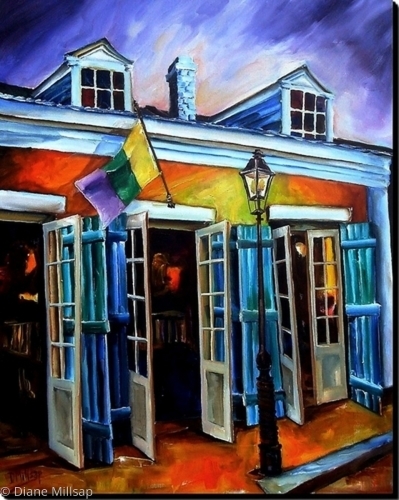 The open doors beckon us to come in and experience classic New Orleans jazz. 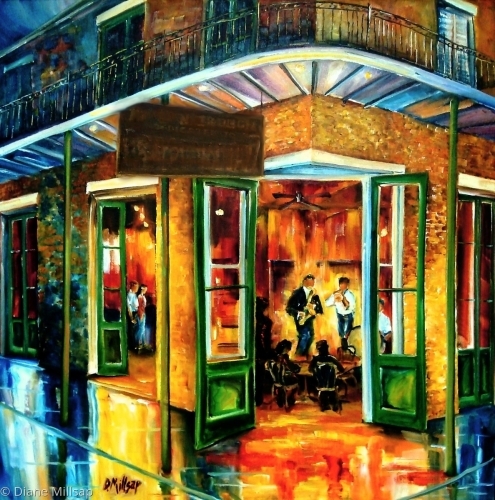 This loose, impressionistic original captures the atmosphere of a jazz club on Bourbon Street. 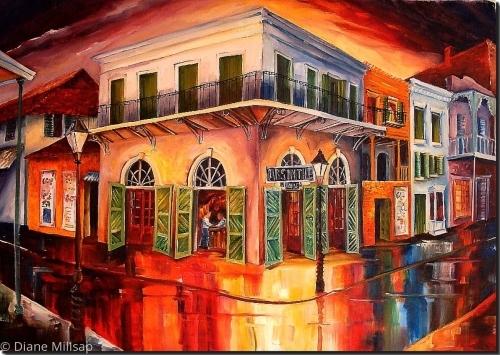 This vibrant original oil painting captures the fun and personality of New Orleans' famed Pat O'Brien's bar. 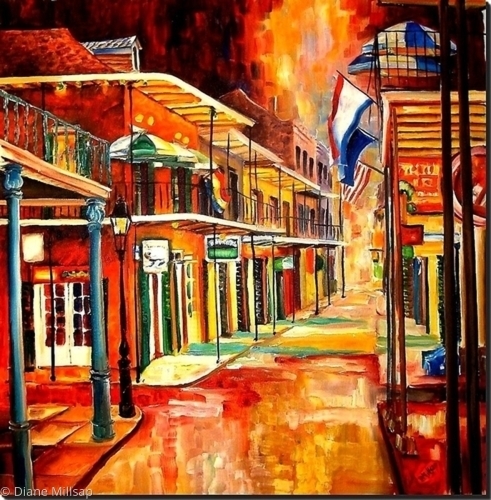 Glowing reds and vivid golds bring this French Quarter favorite to life. This work is painted in Diane's modern impressionist style on a 1 " deep gallery wrapped canvas and may be hung unframed. This is a one-of-a-kind original, and a certificate of authenticity will be enclosed. 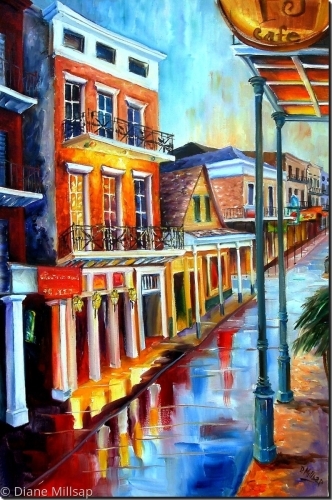 Many of Diane's New Orleans scenes are in print, and this is an opportunity to own an original. 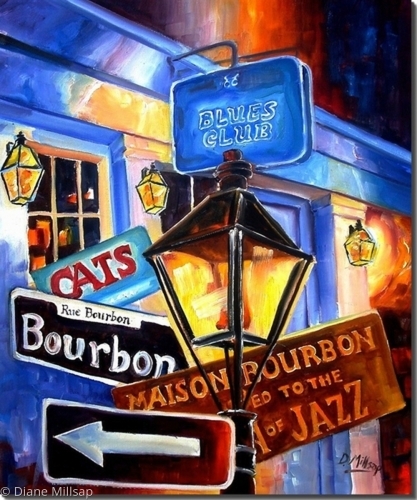 This vibrant original oil painting represents the jazz and blues scene on New Orleans' old Bourbon Street. It is painted in a representational abstract style in glowing oil on a 1 1/2" deep gallery wrapped canvas. 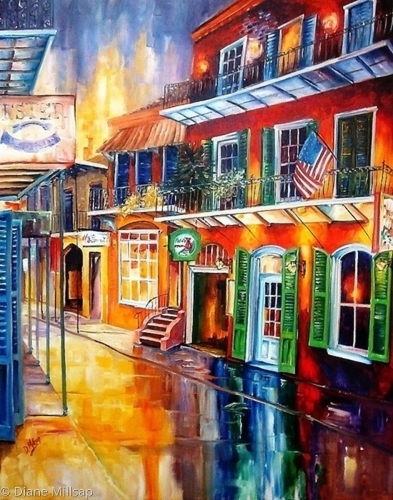 This lively original oil painting captures the lights and the energy of New Orleans fabled Bourbon Street. Painted in an abstract-impressionist style, this painting delivers color and action with bold brush work and texture. 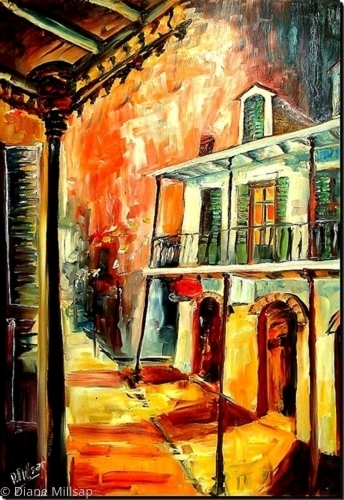 A vibrant, representational abstract of a French Quarter street in New Orleans. Thick, rich oil pigments have been applied with expressive broad strokes. Ready to hang. Edges of canvas painted. 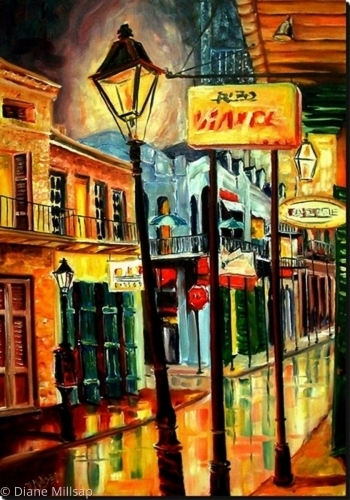 This large original oil captures the personality of New Orleans' Bourbon Street with it's neon lights, balconies, and leaning lampposts. It is painted in an abstract impressionist style with bold, thick brush strokes that add texture. It may be hung unframed. The edges of the 1 1/2" deep gallery wrapped canvas are also painted, and a picture wire kit is included. 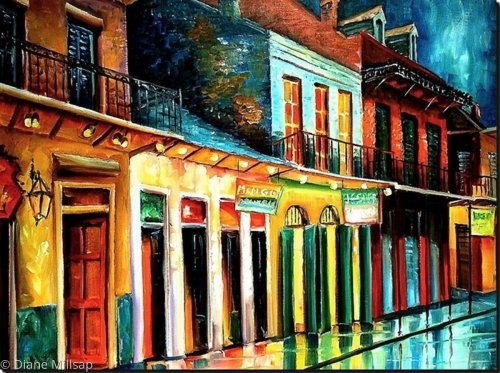 Brilliant, pure color captures the life and vitality of New Orleans' Bourbon Street. This large original oil is painted in a semi-abstract, style with splashes of cadmium red, aqua, and gold. It may be hung unframed if desired. The edges of the 1 1/2" deep gallery wrapped canvas are also painted, and a picture wire kit is included. This is a one-of-a-kind original work, and a certificate of authenticity will be enclosed. 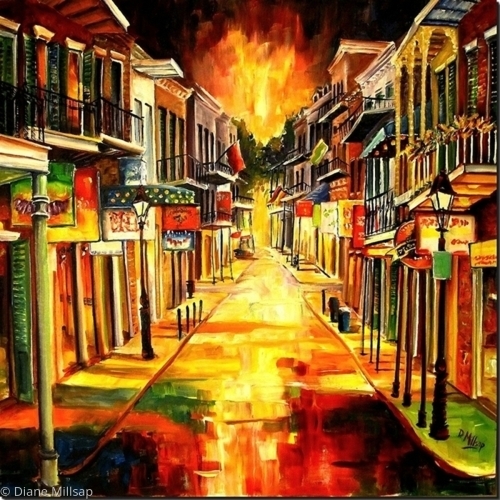 Many of Diane's New Orleans scenes are in print and this is an opportunity to own an original. 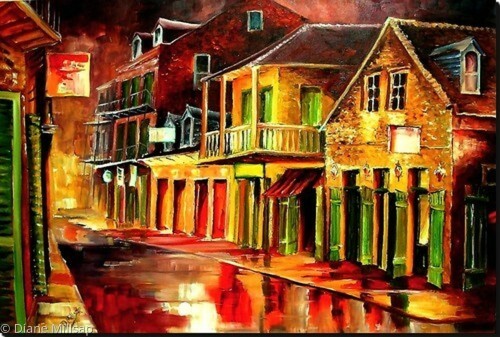 This rich oil painting captures the atmosphere of New Orleans at night. The style is modern impressionism. 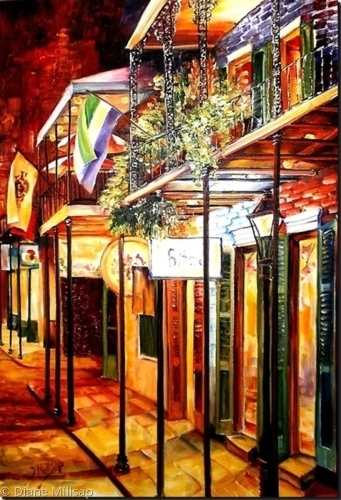 $395.00 - The excitement and the lights of New Orleans' Bourbon Street are brought to life in this large (3 ft. x 3 ft.) original oil painting. It is painted in a semi-abstract styleN, and the canvas has a medium texture. It may be hung unframed. The edges of the 1 1/2" gallery wrapped canvas are painted black. 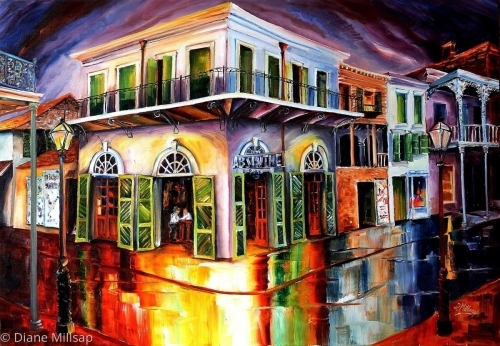 A centuries old building on Bourbon Street stands, with shuttered doors open wide, ready to rock on through the night! Painted in Diane's modern impressionist style, this vibrant, original oil painting is ready to hang. The edges of the 1 1/2" deep gallery wrapped canvas are also painted, and a picture wire kit is included. FOR SALE: Bold colors and darkened doorways reflect the history and legend of New Orleans' Old Absinthe House, named for the notorious drink, Absinthe. This large original oil is painted on a gallery wrapped canvas and is ready to hang. 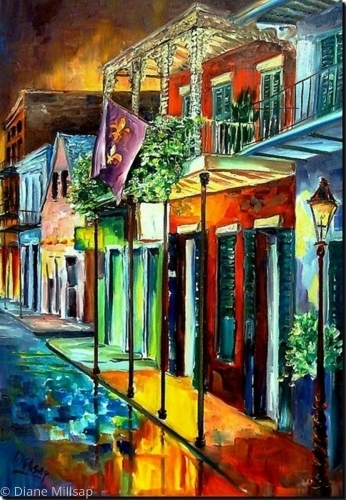 SOLD: As the sun sets, the lights of Bourbon Street beckon to us in this original oil painting. Painted on gallery wrapped canvas, and ready to hang. Please contact me for purchasing information.